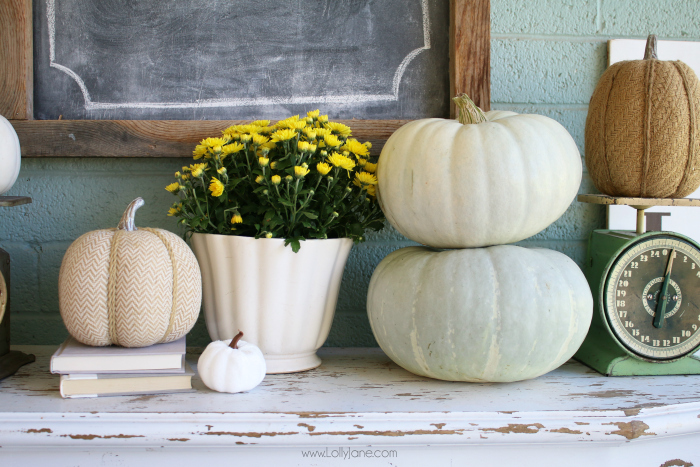 Summer flowers are fading fast, it’s time for mums and pumpkins and gourds! 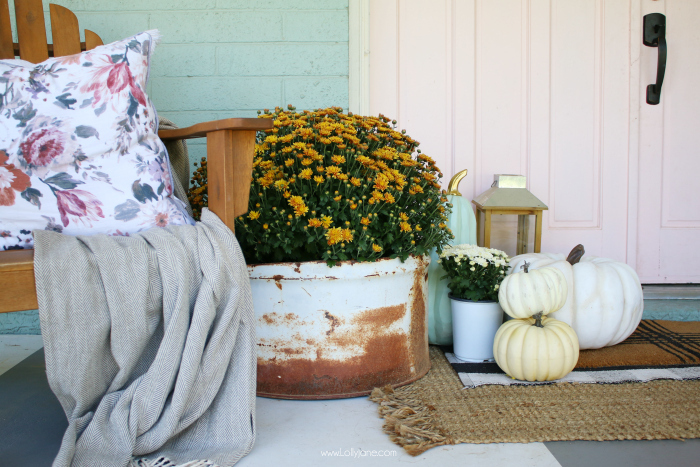 Before you place a pumpkin or two out, check out our easy fall porch decor ideas to step up your front porch decorating this season! 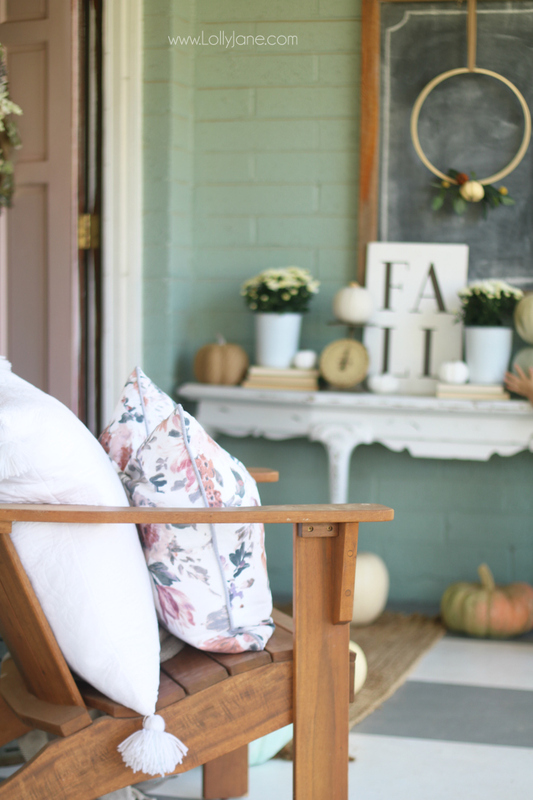 For this year’s front porch fall decor, we kept the space neutral but with some soft splashes of pastels. We love traditional fall colors but our heart this year is all about millennial pink; have you heard that term yet? We’re a little too old to be called “millenials” buuuut we did paint our door a soft blush pink before the trend started so we’re just going with it. 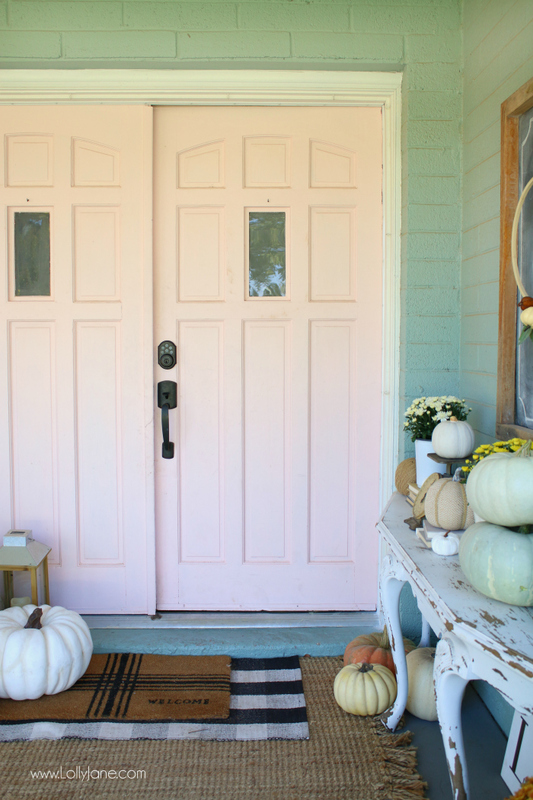 What better way to coordinate said pink painted door than with over-sized pink pumpkins and soft aqua gourds? 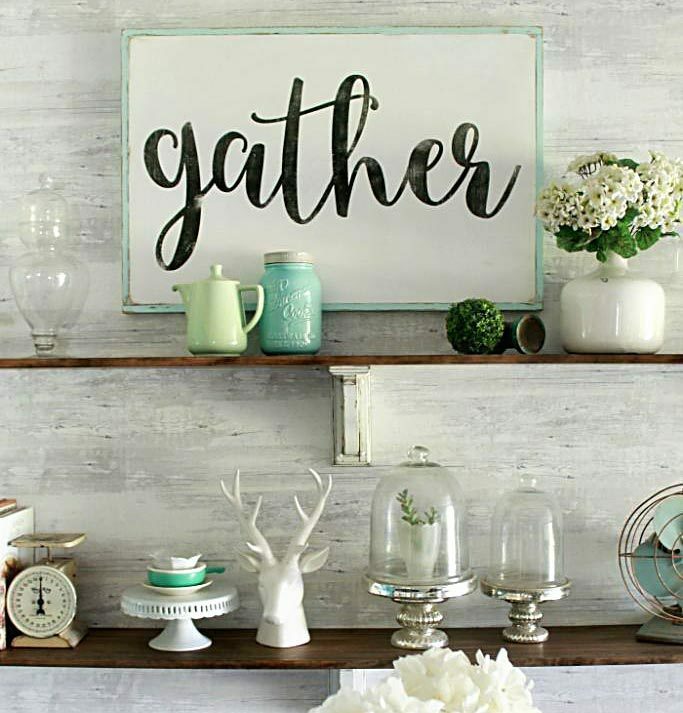 Be sure to read to the end for dozens of ways to decorate for fall from lots of our talented bloggers friends! Enjoy this wonderful fall hop! Welcome to this year’s fall porch! I started to cozy up my porch by layering three mats. We shared this picture on Instagram and the majority of you loved the layered front door rug trend. When you have double doors, it’s hard to decorate with just one mat since the double doors are so wide. 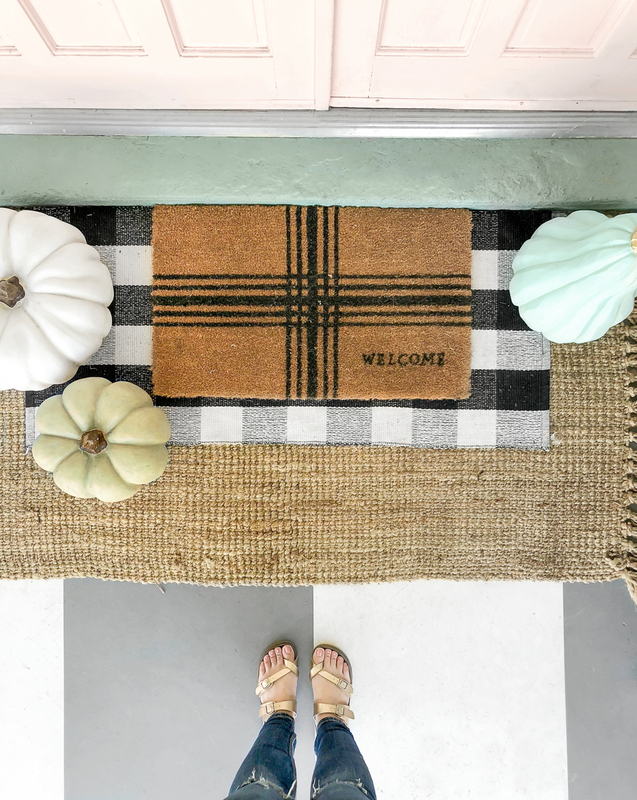 I love this buffalo check rug and have been layering different rugs on it all year, like this current welcome mat. When we nabbed this jute rug, I loved the length and the price and intended to keep it in my entryway. After our kittens were born, I needed a spot to store the black and white rug in my laundry room so it didn’t get ruined with kitty litter soooo the jute moved to the front porch and I love it there! 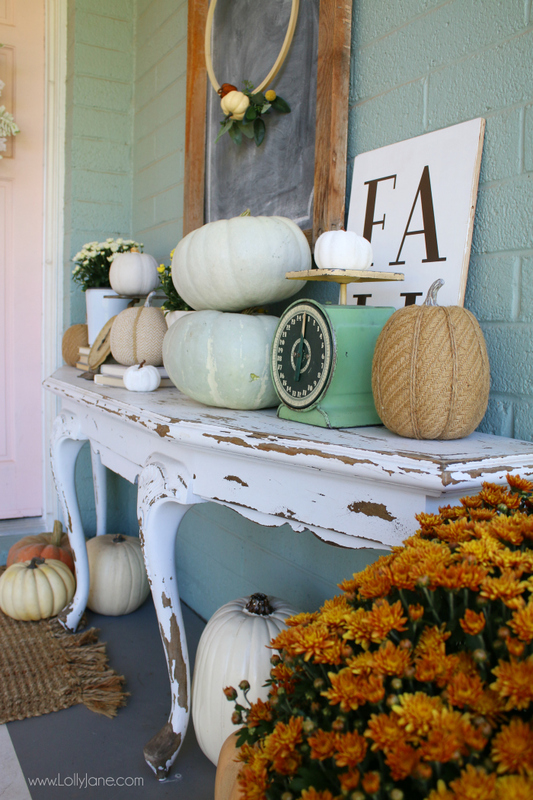 Stacking pumpkins is an affordable way to decorate the front porch for fall. 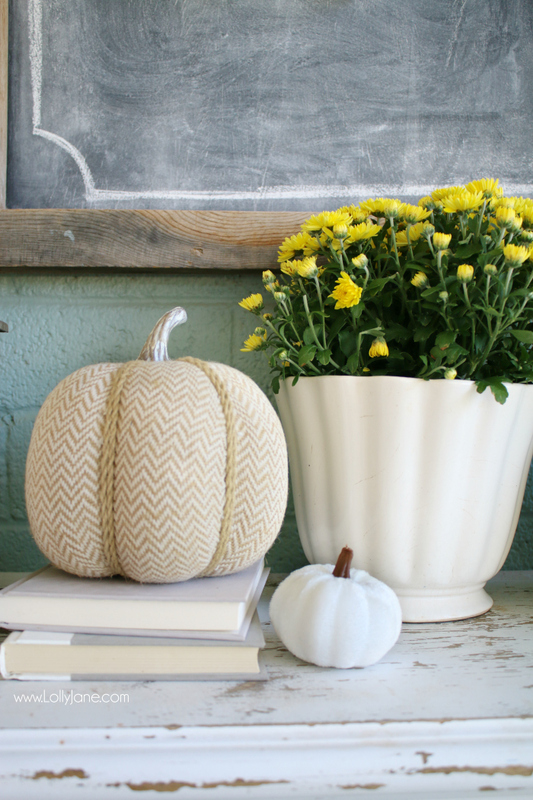 You can use faux pumpkins or splurge on the real deal. We found three over-sized pumpkins and the aqua gourd at HomeGoods while getting ready to kick off their grand opening here in Gilbert. (We’re still over the moon that we were the influencers chosen to open their latest location here in Arizona!) They’re the perfect pieces to ground your outdoor porch decor then to fill it up with white pumpkins and smaller pots of mums. Kristi shared a story on our Instagram, asking how many people feel like fresh pumpkins are worth the money. So many agreed they’re overpriced so they stick with the $5 plain ones. 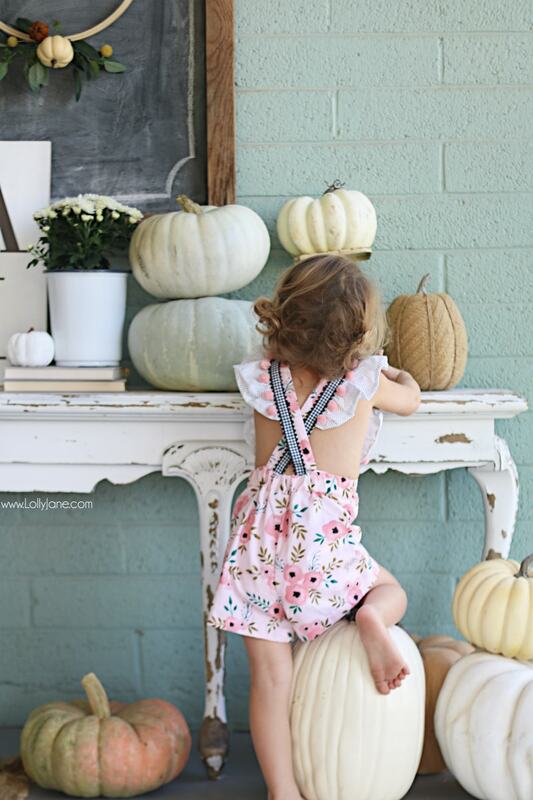 We tend to agree as we decorate for the holidays on a budget but we do love the small splurge of the pink and pastel pumpkins to create non-traditional outdoor fall decor. If you’re like me and don’t really have a set house style, you’ll love how eclectically arranged the mums and pumpkins are scattered. When I was scouting ideas for fall porch decorating, I noticed dozens of mums in all colors: white, yellow, red, orange, even purple. Mums are very affordable when grabbing them in small pots. We picked up 2 white pots and a yellow pot for $15. If you want to go bigger, the large size was $25 and is huuuuge. We have an awesome rusty, vintage bucket that we used for our Christmas porch last year and one large potted mum filled it perfectly. Our little helper loved playing with pumpkins and kept smelling the mums, so sweet. I’m a huge fan of mixing new and old. Since I live in our childhood home on acreage, we have plenty of old around here. Anytime I find scales at thrift stores, I grab one to add to my collection. I love the different patinas of them and wonder where they’ve been all these years? Scales and pumpkins have been on my front porch fall decorating ideas brain for a couple of weeks now and I love the whites against the aged metals. Our fall wood sign is the perfect addition our outdoor fall table decor! We loooooove linens. We have a whole closet full of seasonal pillows and blankets. 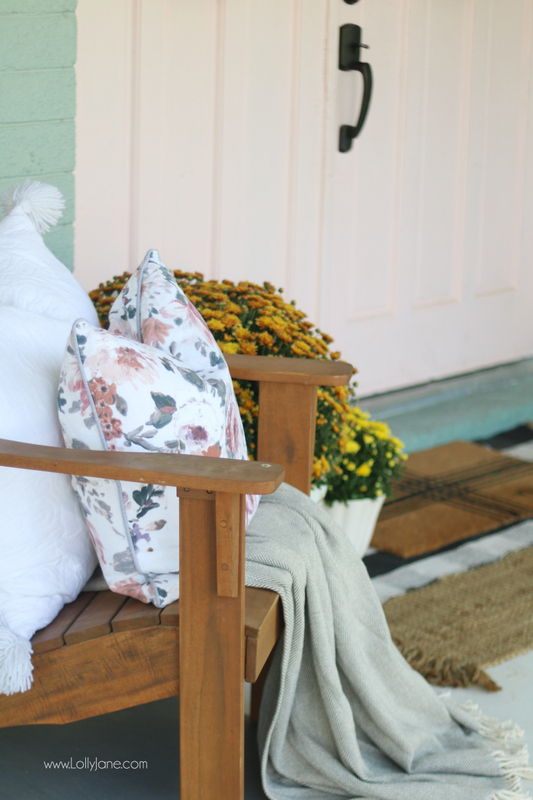 We added these floral pillows (similar ones linked) and a soft gray and white throw to the adirondack chairs out front to welcome guests to sit and stay while. What do you think? 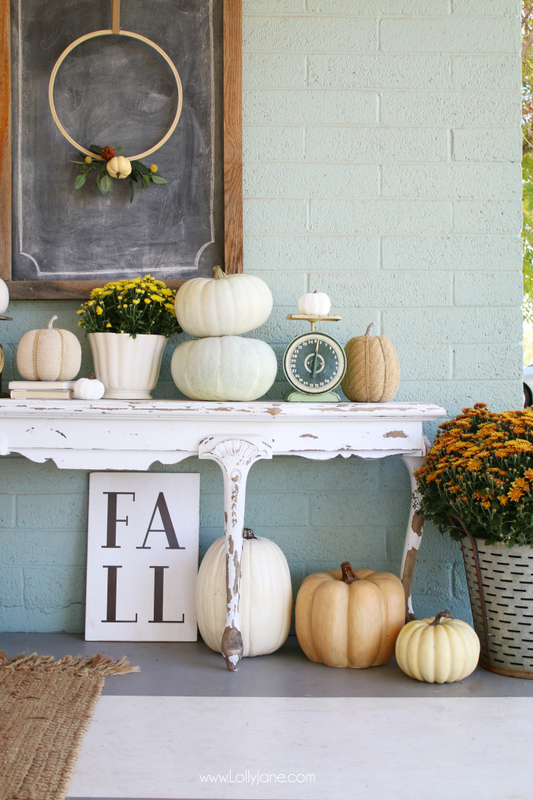 Will you be decorating your porch for fall? Thank you, Tina! We are obsessed with layering rugs, lol! Thanks so much, Lucy!! Appreciate it, friend! Cute! Love the triple mat!! So beautifully done, girls! Suddenly I have the urge to paint my door a fun color… 🙂 Thank you so much for sharing your creative ideas! Such a pretty porch but what really caught my eye is your helper with her curls and adorable outfit!! I love the soft blush pink for fall…it’s such a beautiful neutral colour! Your porch looks lovely…I really love the layered rugs! Oh my goodness, your whole porch is so incredibly charming! It speaks directly to this girl’s vintage loving heart!